At American Metal Crafters, our custom metal boxes and cases are designed and manufactured to meet virtually any special application. Standard sizes and shapes are also available. 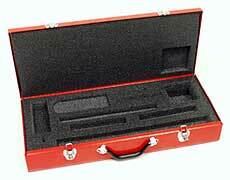 Die-cut foam inserts, such as the one in this power tool box, can be added to any custom application. If you need custom boxes or cases to transfer special or sensitive equipment safely, American can design them using die-cut foam inserts, metal brackets, dividers and custom trays. These can be helpful in many standard applications, including power tool boxes and custom carrying cases. Our custom cases are also ideal for computers, cameras, musical instruments and small appliances. Other options, including personalized name plates and combination or key locks, can further enhance the security of your custom box or case. Cosmetic cases, personal files, tote boxes, recipe boxes and other specialty advertising pieces can also be produced at our facility. At American, we can enhance the look of your metal boxes and metal cases to match your company's image. Powder spray coating is available in any custom color, and silk screening, embossing and decal application are also performed in-house. Our products can be manufactured with a range of metals including steel, aluminum, brass, stainless and galvanized, and can be designed with round or square corners. Call our Sales Department today at (860) 343-1960, or toll-free at 1-800-840-9243, to discuss your custom application, or fill out our online form to receive more information.